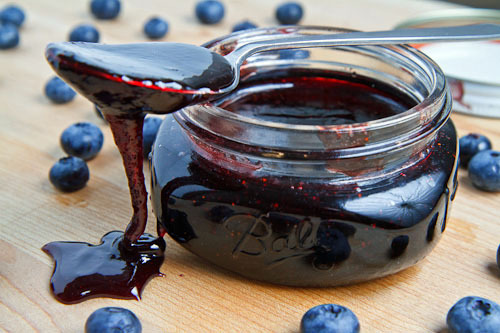 A sticky and sweet caramel sauce infused with the fresh and summery flavour of blueberries. A few weeks ago when I was making a batch of blueberry syrup I idly thought that the basic ingredients of the syrup were a lot like a caramel sauce with the sugar and water and got me to wondering what a blueberry caramel sauce would be like. I mean if water, sugar and blueberries are good then how cold adding more flavour by caramelizing the sugar first not make things better? Alas, I got distracted by something before I could write the idea down and I promptly forgot about it. Recently I came across a recipe that called for a blueberry caramel sauce and I knew that I just had to make it! Over the holidays I made a cranberry caramel sauce for the cranberry turtle bars that I made. For the cranberry caramel sauce I just threw the full cranberries into the caramelized sugar and waited for them to burst in the heat and then I left them in the sauce. For the blueberry sauce however I wanted to have a smooth texture so I decided to puree the blueberries before adding them and after letting everything simmer for a while, I strained the large solid bits from the caramel sauce before returning it to the heat to thicken a bit. The blueberry caramel sauce turned out unbelievably well! After it cooled down it thickened up nicely and it had the most amazing aroma of blueberries. After just one taste I was hooked and found it difficult to not finish it all right then and there! The deep amber caramelized sugar adds a real depth of flavour that makes this sauce truly special. It would certainly be great to serve this straight up over vanilla ice cream or vanilla yogurt but I had something else in mind for it entirely. Place the blueberries in a food processor and puree them. Mix the sugar and water in a sauce pan, heat over medium heat and simmer until the sugar has melted and it has turned an deep amber colour, about 8-10 minutes. Remove from heat and carefully mix in the blueberry puree. Return to heat, simmer for 5 minutes, strain the solids with a fine mesh sieve, return to heat and simmer until it starts to thicken, about 10 minutes. Remove from heat, mix in the lemon juice and let cool to room temperature. Oh MY! This sounds so delicious. I'm imagining it on a scoop of good vanilla ice cream – simple but tasty I'm sure. Thanks so much for this recipe! you had me a blueberry, then caramel! swoon….. the two together sound divine!! my favorites in one! I will need to file this in my must make folder. Oh, that must be delicious over ice cream! some parmesan ice cream, recipe from Hannah Glasse circa 1760. Wow! Great sauce, oozing with a delish glazy caramel. Wow, Kevin, this looks AMAZING! I made some chocolate-blackberry sauce earlier this summer, adapted from one of my canning books, and I've been gobbling it up over ice cream. I think your blueberry caramel sauce looks like it would likewise get gobbled. Thanks for the inspiration 🙂 Yum. This sounds wonderful!! Do you think it could be processed (canned)in a hot water bath for saving and for gifts? nice post .. looks so delicious .. yummy ..
Mark & Terry Rawlinson: I do not do all that much canning and I am not an expert; but the recipe is fairly similar to that of a jam. I would tend to play it safe and store it in the fridge though. Lemon juice VS Lime Juice. when I use lime juice with blueberries I am convinced that the flavor of the blueberries is stronger and better. Is the Lemon juice vital to outcome of the syrups, sauces etc. lettyb: You can easily replace the lemon juice with lime juice in this, and pretty much any recipe, if you prefer the flavour.